As the tension in Libya escalates, on Thursday Gadaffi said he will show no mercy and pity on rebels who want him down. 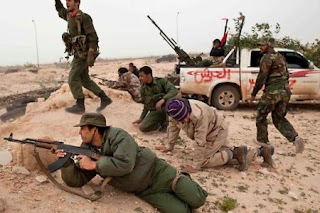 Rebels, who are weaker compared to Libyan loyal military, have now asked for foreign aid to tackle any assault by the Military, loyal to Gadaffi. While American warships have already reached near Libya, most of the nations are against any military intervention or imposing a no-fly zone there. BRIC and G4 nations (Brazil, Russia, India, China and South Africa) have clearly opposed any foreign military action in Libya and are blocking any resolution in UN, which could grant give green chit to military intervention. India is a non permanent member of security council whereas Russia and China has veto power. If All three are not influenced then such resolution can not pass. At the EU summit on 11 March Romanian President Traian Băsescu said, “Among the arguments I want to bring in order to support our position is that this mission of initiating a no-fly zone is a mission that only NATO can have and not the EU. We also consider it is not the moment for a military solution in Libya”. Romania is a member of both NATO and EU. Both Romania and Bulgaria opposed the idea of international intervention in Libya. According to EU observer electronic publication, during the European Council it took the intervention of the German Chancellor, Angela Merkel, to calm things down between French President and Romania, Bulgaria. The only countries which back no-flying zone and possible military interventions in Libya are US, UK and France. Italy is supporting a no-flying zone in Libya as UN has also declared it. 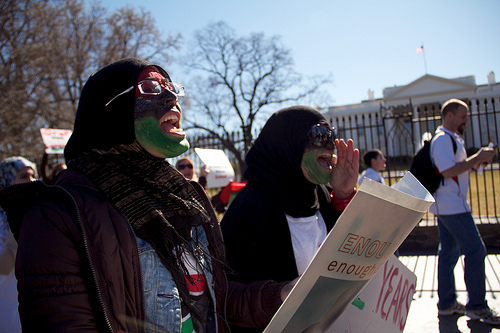 Groups like NATO and Arab League also supports no-flying zone immediately. Canada, Norway, Denmark, Sweden, Finland, Qatar, UAE, Spain have expressed their desire to help NATO and UN for any military intervention, whereas Poland and Lithuania will only support by providing humanitarian aid and evacuation of Libyan people. No flying zone has been declared but implication has not been done yet. The countries which have reportedly helped current Libyan government are Syria and Algeria, by supplying men and weapons to Colonel Moammar Gaddafi. It is believed that Syrian pilots are flying Libyan Mig 23 and Mig 25. A Belorussian Ilyushin Il-76 aircraft left a military base near the Belarussian city of Baranovichi and landed at the Libyan desert airport of Sebha on 15 February sending military equipment, (Source: Stockholm International Peace Research Institute). Zimbabwe is also sending mercenaries to support Gaddaffi. Gaddafi has been ruling Libya since 1969, overthrowing the monarchy. Following the retirement of Fidel Castro in 2008 and the death of Omar Bongo in 2009, Gaddafi is the world’s longest-ruling head of the state. Though the standard of living and literacy rate is considered good in Libya, corruption, investing more than what is necessary in military and arms import and suspected promotion of terror around the world cause him lose popularity and faith of others. Some of the major reasons of opposing military intervention in Libya is the fear of another Iraq, as the war never ended there and the situation became even worse. Western power became so unpopular and the world criticized them. The increasing interference by US and allies in Muslim countries might provoke some extremists group even more and might become a threat to the world. 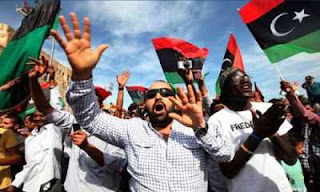 Supporters of the military intervention, specially US, which is a promoter of democracy, believe that an end of dictatorship in Libya is necessary. West can gain a lot if a pro western government is setup in the nation, Libya being an oil and gas rich nation.